Ever thought about living in a ecologically minded community, away from it all? Ever thought about living on the world's 4th most beautiful island, now voted 1 of the world's top 10 regions? 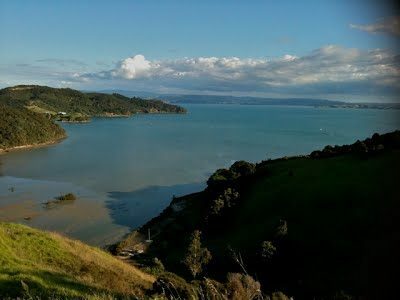 Property is a share in a coastal block of 169 hectares (418 acres) at the northern tidal extremity of Awaawaroa Bay as part of an eco-village. Become a shareholder in a company that is green-minded, community spirited, sustainable & friendly. Shared community facilities include a stunning mud-brick community hall (building shown in pictures), tractors, olives, forestry, vineyards, animals & even a maze! The share is a house site (1/2 hectare) towards the North West area of the land & an additional allotment (1/2 hectare). Has a resource consent with permission build dwellings. It is an elevated, easy contour block of mixed slopes with a South facing view, back dropped by steeper bush clad slopes. A stream passes through the site next to a totara forest. Fruit (best lemons in the eco-village!) olive & natives have been planted throughout. There is a farm track from the road to the site traversing a small wetland. The site is situated above the most beautiful gully of native bush in the entire valley. House site - This area is flat, ideally suited to minimum earthworks. The totara forest that borders the brook is truly magical. The track runs past the house site up to a forestry block for use by the shareholder, & to a ridge where there is the most breath-taking panoramic view of the Hauraki Gulf. Alluvial flat - this is within easy walking distance from the house site and is part of an alluvial plain which the same stream abuts. This beautiful, sun drenched section is nice and flat and perfect for a large food garden. The eco-village is only 5 kilometres away from amenities and the main commercial centre for the island is some 15 kilometres away.